The following is based on the experience of top crabbers & researchers, dozens of years of research by scientists, biologists, leaders in the field and the first successful captive breeders. Straws need temperatures and humidity higher than most other species-this means around 85*F/29.44C and 85% or higher for both. Straws do best in a mix of 5 parts sand to 1 part bio-matter (such as coconut fiber or moss). Be sure to moisten your substrate to a sand castle consistency. You should be able to make a hole with your finger and have the hole stay intact once you remove the finger. 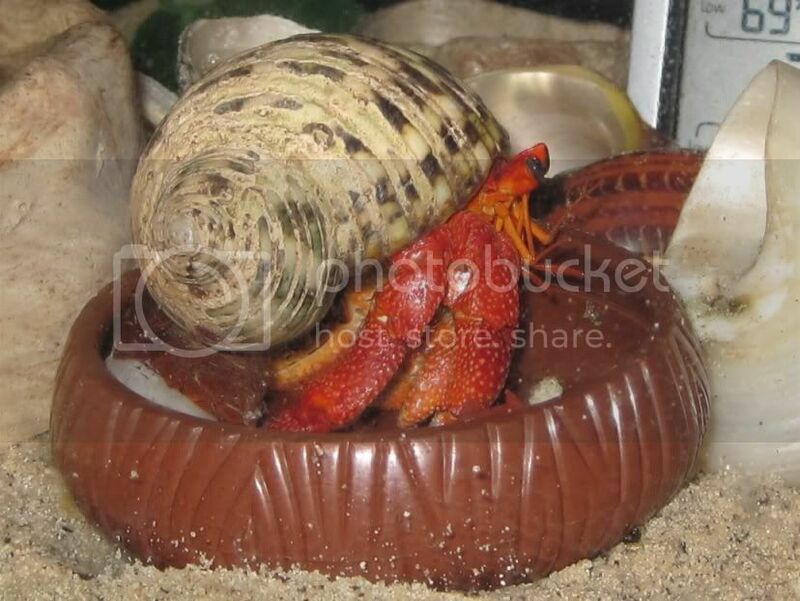 It's important to feed your land hermit crabs a wide variety of fresh and organic foods. There some reputable vendors who sell color-enhancing formulas specifically for c. perlatus. Red & orange foods will also accentuate their natural colors. Each perlatus should be able to dip their shell into pools of both dechlorinated fresh water and another of ocean grade salt water. They need more salt in their salt water than most other species, so keep this in mind. With their beautiful & unique colors, coenobita perlatus are very calm & friendly if kept in the right conditions. They are fantastic diggers & climbers. Research is also being done currently to determine the effect of UVA/UVB light to enhance color. Although in the wild crabs naturally segregate by species about 98% of the time, c. perlatus can be kept with c. clypeatus (Purple Pincher/Caribbean Crabs), c. compressus (Ecuadorians or Es) and c.brevimanus (Indos, brevis or Indonesian Crabs) but should be the same size or bigger than these other species. You should never have just one of a species, get Crabby a species-buddy!